Pâte sablée is the richest of all the French pastry. It's also one of the most difficult to work with due to the very high butter content. You have to struggle for these calories. It's worth the work though; the result is a crumbly, crisp crust or biscuit that does melt in the mouth. It's very much like a fine shortbread but I think the flavour is superior. This recipe is one of M. Roux Snr's. Of course. In a food processor: 250g plain flour, 100g icing sugar and 200g butter (cut into pieces and slightly softened). Pulse until the mix is breadcrumbed. Now add two egg yolks and pulse again. 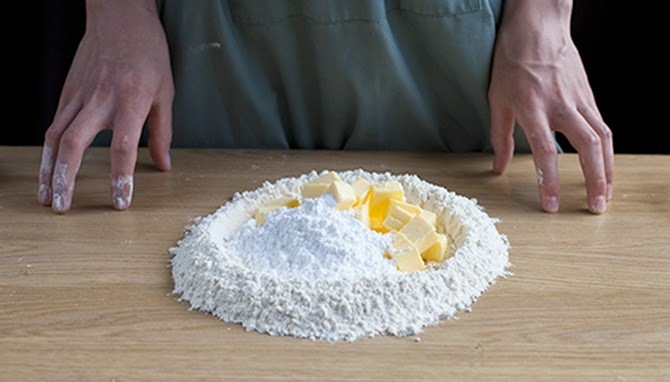 As soon as the mix comes together, scrape out onto a floured surface and knead a few times to fully amalgamate. It will stick to your hands, like an underperforming CEO to their bonus. Wrap in cling film and refrigerate for at least 30 mins. When cold and stiff, the dough is much easier to handle. But still, the trick is to roll out the dough between sheets of greaseproof, or silpat and greaseproof should you be so bestowed. Go as thin as you can; 2mm is ideal. Much thinner and the eventual biscuit will be a liability, shrapnel-ing on contact with eager fingers. Peel off the top layer of paper and bake. Any surface indentations left by the paper will disappear. Bake at 170°C for between 8 to 12 minutes. If you've opted for a chunkier biscuit than it'll be longer still. Watch carefully after 8 mins, especially the edges. The longer the bake, the more developed the flavour but you might prefer the look of the paler. In the pic above, the bake varies by about two minutes. Strawberry crisp made the same way as the apple, fine slice then dry on Silpat in a 70°C oven for at least three hours. The traditional method is to make a well in the flour, adding the butter in the middle and then... yadder, yadder. The traditional method of traversing the globe is on foot and I don't do that either. If I thought the texture was better the old way, I'd do it by hand. I don't, so I do it by machine. Cut the biscuit as soon as you remove it from the oven. I find this easier than fighting with sticky dough. I make indentations with a long ruler before the bake and then follow with a pizza cutter (as seen above). Some chefs use this as a tart case. Good luck with that! Belinda and I used to make Pâte sablée aux fraise, layers of biscuit, strawberries and cream. This is what came to mind when I was asked for a dessert featuring strawberries and rhubarb. I made a simple coulis of strawberries first, glazing the cut fruit with this gives an attractive shine and sweetness (sometimes lacking this early in the season). The cream was vanilla but could have been - should have been - elderflower. The sorbet was rhubarb and rose.